Been in business since 1993! Survival Solutions was started by Demoin Gold to help church groups acquire emergency products at an affordable price. They started by packaging the products in “Milk Cartons”, then colorful boxes in a carrying case. In December 2003, Demoin and his associate Scott Miles sold the company to Demoin’s sister, Delois Stinson, and we moved the company to Layton, Utah. Over the years the company has expanded to offer more emergency products and survival kits. We now offer about 15 different emergency kits of different sizes and purposes, that we package in our warehouse. We also have in stock water barrels and filters, a full line of food storage and emergency preparedness supplies, camping supplies, humanitarian supplies and CERT supplies. We carry specialty items such as solar ovens and a solar powered energy sources, indoor heaters, and canning supplies. Our kits are planned one per person, so that clothing, personal items, medications, etc. can be added to complete a person’s personal survival needs. Our kits include a 3-Day Food Unit of comfort foods that would help to relieve a stressful situation, and that children would be willing to eat. Our Adult Emergency kits include a gallon water pouch that can be filled and refilled as needed. Our kits are available in adult and child size. Our Adult Emergency kits are available in backpacks or wheeled backpacks. Our Emergency Kits include supplies from all 10 areas of survival needs, making them a kit that can be depended on in an emergency. Our kits have been recommended and sold by the American Red Cross, Greater Salt Lake Chapter for several years. Our kits have been tried and tested by a Fire Department in Indiana to see if they would last for three days. They passed the test with excellent recommendations. We offer discount prices for any group orders. Our company policy is not to spend a lot of money on expensive advertising, but instead to pass the savings on to you, our valued customers. Our goal has always been the same. We are dedicated to providing the finest emergency and preparedness supplies possible to as many people as possible by offering these essential items at the lowest discount prices available. In April 2006 we opened our second store in a 100 year old building in the Historic Area of Springville, Utah County. We hope this will be convenient for our Utah County friends and customers, and those from the southern part of the state. January 2007 was another milestone for us. We remodeled our Layton store, doubling our warehouse, and expanding our sales floor area by about four times the space. With this additional room we have added a line of in-stock food storage and larger items such as Fire Escape Ladders, Solar Ovens, and Water Filters. We offer free classes to the public on many emergency preparedness topics, to help us all become more prepared to handle an emergency. We have also become very active in the CERT program in our community and most of our employees are CERT certified. Come visit us at our stores where you can see all our kits and products, and make your decision of which ones are right for your needs. 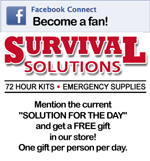 Become a fan on Facebook for our Solution of the Day and in store deals.